Rustenberg has a wine-growing history dating back to 1682, when Roelof Pasman from Meurs, near the Rhine, recognised its wine-growing potential. 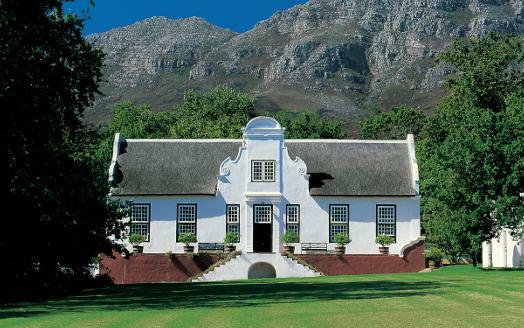 In the early 1800s Rustenberg was divided by owner Jacob Eksteen and a section was given to his son-in-law, who named it Schoongezicht and sold it soon after. Rustenberg and Schoongezicht were at their peak around 1812. But by mid-century, recession coupled with disease caused the vineyard to go bankrupt. Schoongezicht was rescued in 1892 by John X Merriman (who was to become Prime Minister of the Cape), and Rustenberg by his brother-in-law Sir Jacob Barry. Together they revitalised the farms. Fruit was sent to Covent Garden; new vines were grafted onto disease-resistant American rootstock; wines were exported to England and the Continent. In 1941 Peter and Pamela Barlow bought Rustenberg, later acquiring Schoongezicht and reuniting the properties. Their son Simon took over the running of the farm in 1987. The Barlows have been at the property for over 60 years: the longest period any one family has owned the farm. The Rustenberg John X Merriman is a blend of 51% Cabernet Sauvignon, 35% Merlot, 7% Petit Verdot, 4% Cabernet Franc, 3% Malbec The grapes are from vineyards in Simonsberg, near Stellenbosch in the Cape area of South Africa. The separate batches were blended after 11 months and then returned to barrel for a further 9 months' maturation. (46% new and 54% 2nd- and 3rd-fill 225L French oak barrels). The oak really hits you on the nose in this Merriman 2009 and there is plenty of flavour in multiple layers with heavy duty fruit interwoven with tannins and dry notes. Nice stuff, particularly at this discounted price from Waitrose. Recommended.